This book is first of its kind on this subject. 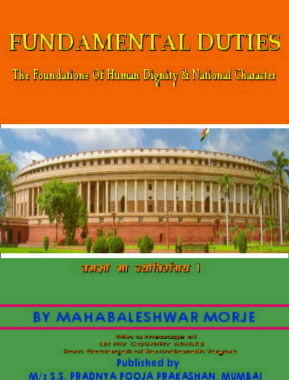 The Fundamental Duties are described as ‘the foundations of human dignity and national character’ because these duties deal with religious, historical, philosophical, moral, social, educational, cultural and legal aspects of human dignity and national character. Part I deals with history and object of fundamental duties on the basis of religious commentaries based on Shrimad Bhagwat Geeta, Quran, Bible etc. It also refers to philosophical background of duties from early days of great philosopher Socrates. Duties are considered as Ten Commendments. The Penal Provisions are considered not necessary as it is the duty of every citizen to obey and perform the fundamental duties in the interest of mankind and welfare of the nations. Part II further deals with discussion on each fundamental duty with a comparative historical, educational cultural and legal study. The duties are also explained with the help of illustrations and quotations. Part III refers the Judgements of the Supreme Court and High Courts. Part IV refers to the Law and Jurisdiction regarding the Fundamental Duties. Part V refers to the constitutions of several other nations including U.S.S.R, China, The Federal Republic Republic of Germany, Japan, Czechoslovakia, Spain, Venezuela, Yugoslavia, Italy, Argentine, Finland, Rumania, Korea, Nepal, Albania, Egypt, Guatemala etc. Part VI refers to Interim Report of the Committee set up by the Government of India , under the Chairmanship of Justice J.S.Verma to make suggestions to teach the Fundamental Duties to the Common man. Part VII refers to conclusion . The book will be found useful, informative and interesting by the students, lawyers, politicians, philosopher, social workers, educationists, statesmen and common men. The First Edition of the Book was released at the hands of Shri Vasantdada Patil, then the Chief Minister of Maharashtra in the year of 1977 at Mantralaya, Barrister Rajni Patel, then the Chairman of the Bombay Pradesh Congress Committee; Hussein Dalwai, minister for Law and Justice of Maharashtra State; Shri Ramrao Adik, then the Advocate General of the State of Maharashtra was the Chief Guest. Shri Vasandada Patil, Chief Minister of Maharashtra while releasing the book said that from the speeches he could gather that the book on the basis of the lives of the great National and Inter National Leaders who have fought for freedom and for social and economic development have inspired this author to write this book. He said he would have been happy if the book was written in the language of the common people i.e. Farmers, Workers, and peoples from Weaker-Sections of the Society, so that they could read it and get inspired and get benefit of this book. The Author of the book also assured the people that the steps will be taken to see that the book will be translated in most of the Regional languages, including Marathi, Gujarati and Hindi.